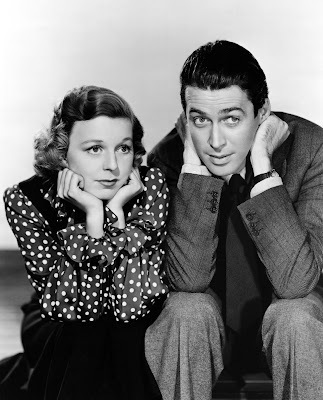 Today, I'm writing about The Shop Around the Corner (1940) starring Margaret Sullavan and James Stewart, and the two remakes of that classic romantic comedy, In the Good Old Summertime (1949) and You've Got Mail (1998). This article is for the They Remade What?! blogathon hosted by Phyllis Loves Classic Movies. 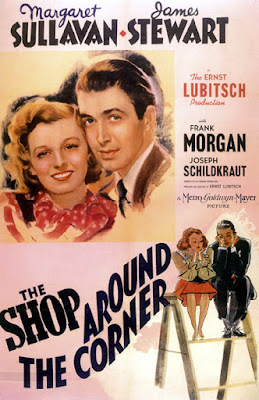 The 1940 film The Shop Around the Corner, about a pair of bickering store clerks who are secret pen pals, is one of old Hollywood's timeless romantic comedies. 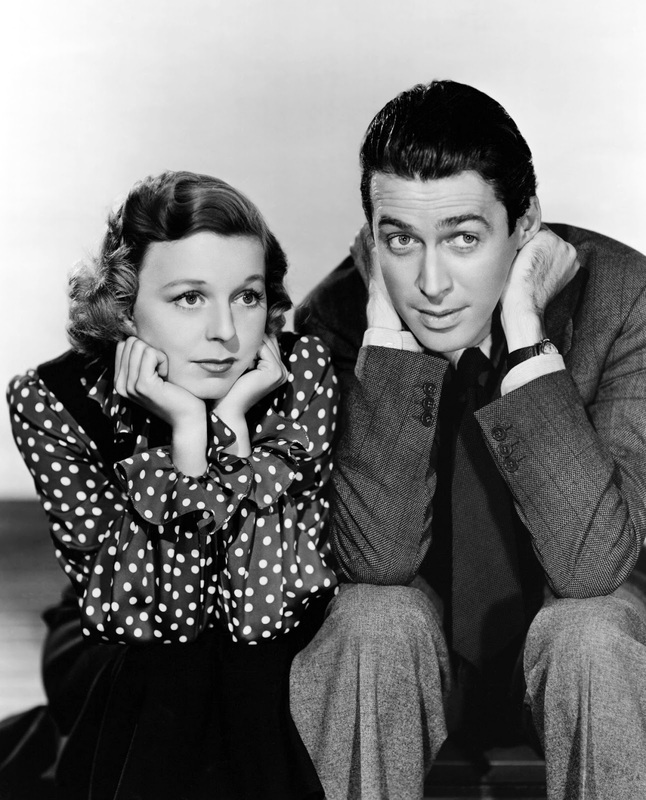 The great director Ernst Lubitsch transformed an obscure Hungarian play into a profound statement on the nature of love filled with sparkling dialogue and unbeatable chemistry between costars James Stewart and Margaret Sullavan. 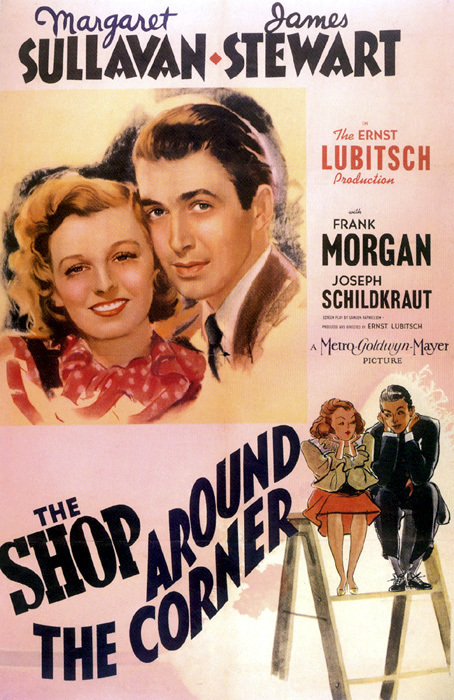 The Shop Around the Corner is one of the best old Hollywood movies, but its clever plot inspired two interesting remakes: the Judy Garland/Van Johnson musical In the Good Old Summertime (1949) and the Tom Hanks/Meg Ryan rom-com You've Got Mail (1998). My first experience with this trio was seeing In the Good Old Summertime as a child, but I'm going to start out this review with a look at the famed "Lubitsch touch" in The Shop Around the Corner. By 1940, Lubitsch was renowned throughout Hollywood for his popular movies that combined romance and wit. Lubitsch had made his name with sophisticated fare like Design for Living (1933) and Ninotchka (1939), but his dream project was adapting Miklos Laszlo's 1937 play Parfumerie for the big screen. Lubitsch had bought the rights to this simple story about an anonymous correspondence between a pair of perfume shop employees shortly after its debut, but he sat on the property for a few years until he got the right studio (MGM with its luxe production values) and the right stars (Lubitsch never wanted anyone other than Stewart for the male lead, but several actresses, including Janet Gaynor, were considered before Lubitsch settled on Sullavan). The Shop Around the Corner tells the story of the assorted employees of a notions shop in Budapest. The main characters are head clerk Alfred Kralik (Stewart) and new employee Klara Novak (Sullavan), but the film is really an ensemble piece that focuses on each employee in turn, including the curmudgeonly boss, Matuschek (the Wizard of Oz himself, Frank Morgan), a kindly family man, Pirovitch (Felix Bressart), and a handsome, but vain salesman, Vadas (Joseph Schildkraut). 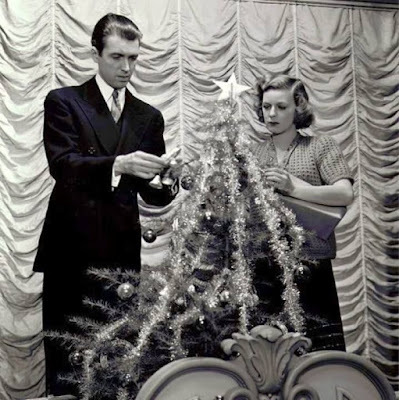 James Stewart and Margaret Sullavan decorate Matuschek's store windows in The Shop Around the Corner (1940). Lubitsch, who helped write the screenplay with Samson Raphaelson, based The Shop Around the Corner on his childhood memories. Lubitsch's father was a tailor, and he grew up helping out in the family's shop. "I have known just such a little shop in Budapest," he said at the film's Radio City Music Hall debut. "The feeling between the boss and those who work for him is pretty much the same the world over." It is those universal feelings that make The Shop Around the Corner a great work of art. The relationship between Klara and Alfred is well-drawn -- they get off on the wrong foot and things go downhill from there -- and Sullavan and Stewart have great chemistry, but the film's central theme expands to fit everyone at the shop. 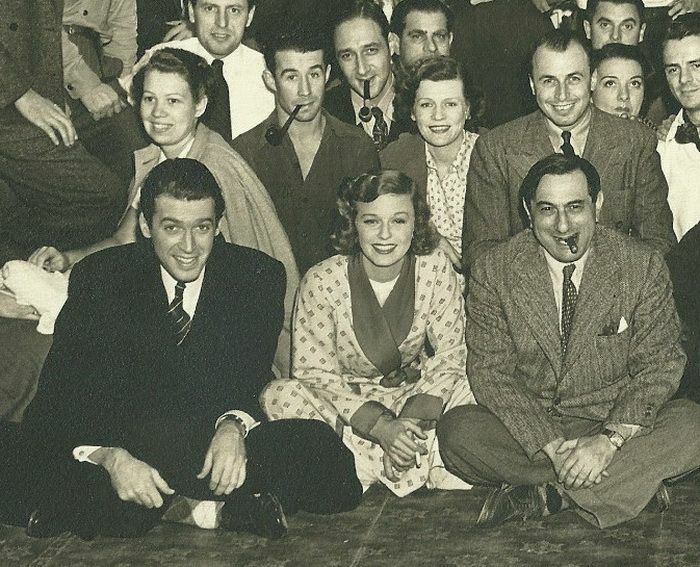 The cast and crew of The Shop Around the Corner (1940) with director Ernst Lubitsch (right with cigar). Lubitsch's great theme was love, whether it was the amorous con artists in Trouble in Paradise (1932) or Greta Garbo and Melvyn Douglas' ideology shattering love affair in Ninotchka. However, in The Shop Around the Corner, Lubitsch moves beyond romantic love to encompass the universal desire for love in all in its forms from the warm relationship that Pirovitch has with his wife and children to the smug self-love of Vadas who has an affair with the boss's wife. One scene in particular always stand out for me. Matuschek, having lost the love of his wife and attempted suicide, is all alone on Christmas Eve. He is a decent employer, but he is also a stern man who has always maintained a certain distance from his employees. Faced with spending the holiday alone, his facade crumbles. One by one each employee declines his invitation to a fancy restaurant until just he and a lowly delivery boy (Charles Smith) are left alone on the snowy streets. Matuschek swallows his pride and asks the boy to Christmas dinner with all the trimmings, and as they banter back and forth about their favorite dishes (stuffed goose, cucumber salad with sour cream) Matuschek's face lights up with the joy of finding a true friend for the first time in many years. The Shop Around the Corner will be shown several times during December on TCM. To check for airtimes, go to www.tcm.com. It is also available on DVD, Blu-ray and video on demand. In the Good Old Summertime transfers The Shop Around the Corner's Mittel-European setting to turn of the century Chicago where Andrew Larkin (Johnson) and Veronica Fisher (Garland) are bickering employees at a music store. The movie follows The Shop Around the Corner's template of two anonymous pen pals who can't get along in real life, but the story is considerably lightened up to make way for the sunny MGM musical formula. The Schildkraut character is completely eliminated and this time the boss is an essentially comic character played by the always endearing S.Z. Sakall. The music shop still has a colorful assortment of employees, most memorably silent film genius Buster Keaton, who, at one point, executes the perfect pratfall, but the focus is much more on Andrew and Veronica's relationship. Screenwriters Albert Hackett, Frances Goodrich and Ivan Tors updated the 1940 movie by giving Andrew a violinist lady friend (Marcia Van Dyke) and Veronica a doting aunt (Lillian Bronson). The focus is further placed on Garland by the musical numbers. Even though In the Good Old Summertime is billed as a musical none of the other stars were singers, which means most of the numbers are performed by Garland; in fact, In the Good Old Summertime sometimes feels like a turn of the century version of Judy at The Palace, which is actually one of its charms. 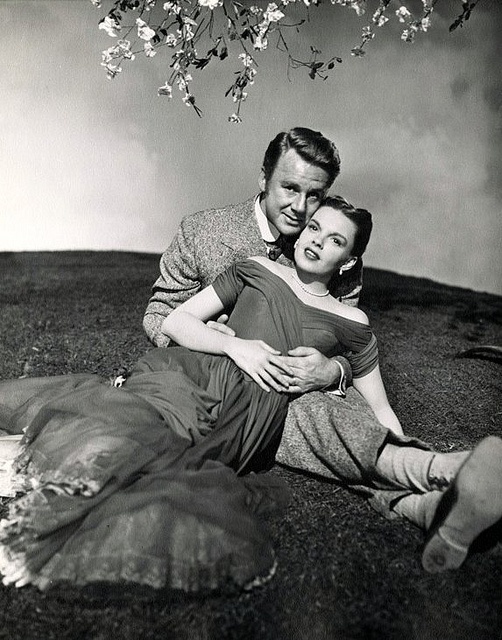 While In the Good Old Summertime lacks the Lubitsch touch, it is still a charming holiday classic that features a great performance by Van Johnson (I actually think it's the best role of his career), great songs by Garland and an irresistible supporting cast. Be sure to look for the screen debut of 3-year-old Liza Minnelli in the final scene. In the Good Old Summertime will be shown several times during December on TCM. To check for airtimes, go to www.tcm.com. It is also available on DVD, Blu-ray and video on demand. Writer and director Nora Ephron's delightful romantic comedy You've Got Mail updates The Shop Around the Corner formula for the Internet age. Kathleen Kelly (Ryan) is the owner of a charming children's bookstore named (you guessed it) The Shop Around the Corner, who is carrying on an anonymous e-mail correspondence with Joe Fox (Hanks), the owner of a big box bookstore that is taking away Kathleen's customers with "deep discounts and designer coffee." Ephron moves the focus from the shop as a surrogate family and onto Kathleen and Joe, who are both in significant relationships with other people (Greg Kinnear and Parker Posey). The first half of the movie concerns Kathleen's battle against the big box stores -- ironically, for a movie that is anti-corporate greed, it contains prominent product placements from AOL and Starbuck's -- but the second half of the film follows The Shop Around the Corner's plot quite closely, at least where it concerns the romance between the two leads, although Kathleen and Joe's path to true love is more drawn out than in the previous movies. The lovers unite at Christmas in The Shop Around the Corner and In the Good Old Summertime, while the audience has to wait until springtime for Joe and Kathleen to find their happily ever after. 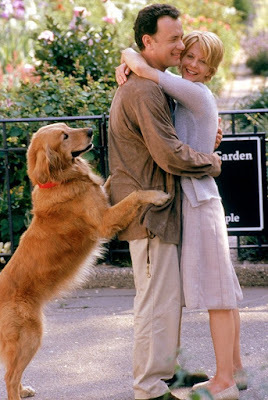 The chief joys of You've Got Mail are the marvelous supporting cast that includes Dabney Coleman, Jean Stapleton, and Dave Chappelle, and Ephron's sharp writing. I love her films, which are filled with witty observations about human nature and the battle between the sexes. My favorite of her films is Julie and Julia (2009), but You've Got Mail is also a wonderful, joy-filled movie about life and love. You've Got Mail is available on DVD, Blu-ray and video on demand. For articles from my past blogathons, go here. A perfect selection of films for this particular blogathon. I could watch "The Shop Around the Corner" on a loop the way my son watches Disney movies. Despite the talent involved I have never been able to find any affection for "In the Good Old Summertime". "You've Got Mail" was released at a time when I developed a sudden aversion to Meg Ryan (and I'm an old time "As the World Turns" fan!). I must be over that by now. One of these days ... "You've Got Mail". This was the first time I watched You've Got Mail and going in I though Meg Ryan was going to be nails on a chalkboard, but I actually enjoyed her performance. She was pretty nuanced and believable while Tom Hanks grated on my nerves a little bit because I thought he hammed it up too much. Lovely selection, I adore The Shop Around the Corner and You'Ve Got Mail. Both are charming films, In the Good Old Summertime has eluded me, but it sounds cute, I will have to catch it! Great post! I'm another one who loves The Shop Around the Corner. Stewart and Sullavan have such great chemistry! I haven't seen In the Good Old Summertime, but I will have to see if I can stream it online. I have, however, seen You've Got Mail which is one of my faves. I have to watch it at least once a year! Great post! The scene you mentioned in The Shop Around the Corner also gets me - poor Mr Matuschek! I watched You've Got Mail first, with my mom I believe, and I only saw bits of In the good old summertime. I really need to revisit the other two as I saw them both when I was young. I didn't even know Buster Keaton back then!! I've recently been rewatching films that didn't make much of an impression when I watched them when I was young (Maltese Falcon, The Best Years of Our Lives) and discovering they were MUCH better than I remembered. I'm going to make an effort to rewatch these SOON!!! I enjoyed this blogathon so much because I got to watch In the Good Old Summertime again (I didn't remember much about it because I hadn't seen it in decades) and I really enjoyed You've Got Mail, which I had never seen. I love The Shop Around the Corner so much - for me the father/son type relationship between Frank Morgan and Jimmy Stewart's characters is just as important as the romantic love relationship. So it's fascinating to learn that Lubitsch's memories of his own father fed into this film. PS, I see you are taking part in a few blogathons, so wondered if you might like to join in the Sinatra Centennial blogathon I'm co-hosting? I've seen all of these versions of the story and each was a delight. My favorite is In the Good Old Summertime due to it's setting in time and the musical aspect, but it's also hard to beat The Around the Corner. The basic story is a good one so it's difficult to botch unless ridiculous inappropriate elements were added. The story should be as charming as traditionally depicted. Like the seven samurai, this is just an idea that makes a good movie. I have now seen all three of these films. I have to say SHOP AROUND THE CORNER is my all time favorite!!!! Then follows YOU'VE GOT MAIL!!!!!! I personally didn't care for IN THE GOOD OLD SUMMER TIME. I think Stewart and Sullavan played the parts smoother and didn't act so " corny" as did Johnson and Garland. I don't care for it being a musical. I'll continue to watch the other two though. Was there a fourth one with the same story and Irene Dunn?? The sotry was also adapted into the 1963 Broadway Musical "She Loves Me" set in a Budapest perfume shop. Great write up. Shop Around the Corner is my favorite movie. Apart from the protagonists' love arc, it did a great amount of justice to the supporting characters as well. And the way those Ochi chyornye boxes play a role well until the anti penultimate scene is nothing short of laudable! I am watching all three for the first time . Hopefully I will finish all of them this week. I can return here and give my thoughts about them. I also love the Julie and Julia movie it’s one of my favorites. A feel good movie I can watch over and over.